Temperament: Happy, confident, intelligent. Active working dog. Good with children and dogs. Sheds seasonally and needs occasional grooming. Highly biddable. Flat coated retrievers were developed in the UK to be hunting bird dogs from ancestors imported from North America like the St. John’s water dog and the Newfoundland. Founders also included collie-like dogs and Setters. The breed was officially recognized in 1915. Only a small number of dogs existed after World War II, but careful management by breeders brought their numbers back up. This suggests evidence of at least one bottleneck in the population. Flat Coated Retrievers have only a comparatively small portion of the diversity that exists today in modern village dogs, evidence of one or more genetic bottlenecks in the breed. One half of Flat Coated Retrievers, when assessed with village dogs, had IR values that ranged from +0.304 to +0.633. Since the average IR of offspring of full siblings is 0.25, that means that half of Flat Coats when compared to village dogs are more inbred than dogs whose parents are full siblings. 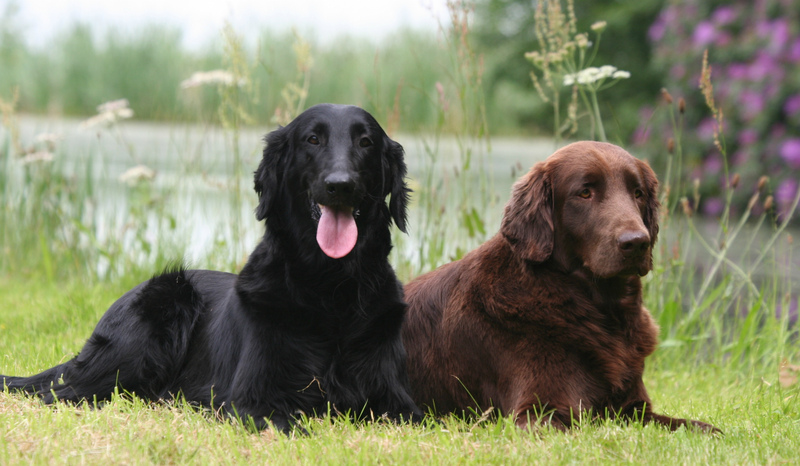 This highlights the necessity for Flat Coated Retriever breeders to be very careful to avoid further overall inbreeding which leads to further loss of diversity. The population of 190 Flat-Coated Retrievers first tested had an average number of alleles of 5.182. This number is low compared to other breeds that have been tested, once again confirming that there is a low level of genome wide genetic diversity in the breed. The mean effective alleles per locus were 2.592, also one of the lower effective allele values that we have observed. However, the distance between the average and effective alleles shows the breed community has done a reasonably good job of retaining what diversity exists. Nine STR-associated DLA Class I and 10 DLA Class II haplotypes in 292 Flat-Coated Retrievers have currently been found. Two Class I haplotypes are unique to the breed (1142 and 1143) while all the others have also been found in other breeds. This is the second lowest amount of DLA found to date in a breed. This breed has suffered a severe bottleneck and needs careful management. Flat Coat breeders should continue to strive to maintain their existing diversity by breeding less related dogs whenever possible, in addition to selecting for good health, temperament and desired traits as usual. Try to breed for a higher OI and lower AGR than parents. Select for outbred, low IR litters. At times, it may make sense to breed for a higher IR litter in order to retain rare genetics. Make an effort to breed for heterozygous DLA types with emphasis on the least common DLA types when possible.